HDPE Ropes or Commonly refered as Plastic Ropes is Rope manufactured from Plastic Polymer mono filament. Water asorbtion is minimal,It has controlled elongation, is light weight, floats on water, is easy to handle and is inert to chemicals depending upon the Grade used. 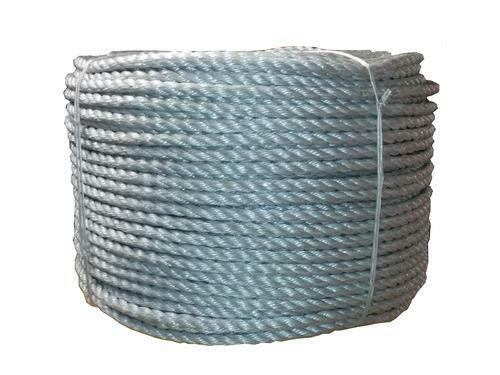 These Palstic Ropes have multiple uses from Shipping Industries , to packing, nets, twine, clothe-Line etc., The List is endless . In short it is a Multi Utility Product. The thickness of the rope is from 3mm to 24mm. These ropes come in a variety and multitude of colours. The ropes are available in both the braided and the twisted form like 3 Strand Rope, 4 Strand Rope,S Twister Rope and S & Z Twister Rope. and are available as per the user's demands. The tolerance of the rope is 3 MM to 14 MM i.e. 7%, and 16 MM to above i.e. 6%. Contact with food products is acceptable. 25/100/200/300 yds. and any type of length as per buyer requirement. It's Available in Coil Packing as well as Hank Packing. Each coil is neatly straped/tied & than packed in poly bag and Further in Plastic Woven Bales. Assorted colour packing or single colour packing as per buyer requirement. Coiling & Packing can made as per Buyers Demand. "MEI" is primarily a global trading organisation with worldwide interests. It was founded in Maharashtra, India in 1990 as an independent entity and chiefly focuses on the export of various Indian products. We export our products to over 21 countries and our primary markets include the African continent, Europe, the Middle East and Asia. We at "MEI" strongly believe that operational efficiency, flexible strategies and challenging to our competition assists our trading nucleus and allows us to fine tune ourselves to meet the ever changing demands of today's trading world. We ensure a strict and demanding approach when it comes to procuring our products and maintain a high standard of quality control and ensure timely delivery. This, along with efficient communication with our customers ensure that we have a diverse but a satisfied client base.